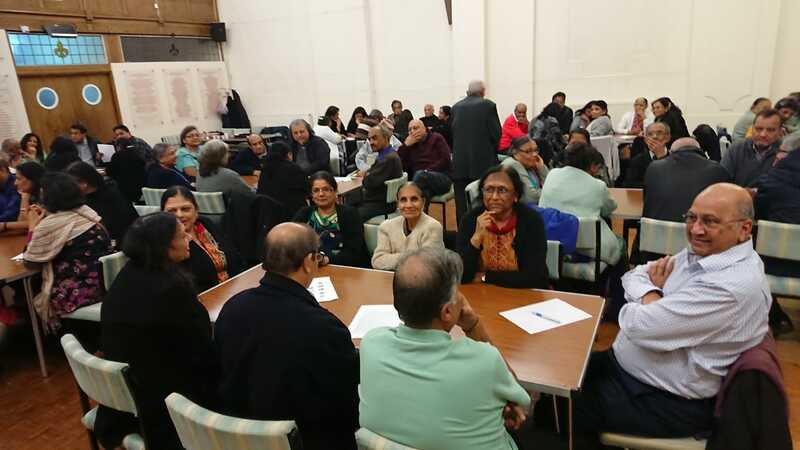 Diwali with Games & Quiz | Oshwal Association of the U.K.
Over 80 people descended on Shakti Centre to attend the programme of Diwali with a Twist, sorry, Games & Quiz! The doors opened at 4pm and people started to trickle in and half an hour later almost all had arrived eager to enjoy the renowned delicious food and experience at first-hand what all the fuss was about the Quiz! Full Dinner was served first! Everyone was excited about the Quiz and with full stomachs were raring to step into the unknown and take up the challenge. All those who were participating were each given a playing card and those with the same suite were grouped in teams with there being ten teams of eight people. The Quiz consisted of three general knowledge/history, music and geography rounds entwined with three table quizzes of solving riddles, anagrams and picture round. Shejalben started off by announcing the rules and the most important being that there was “One golden rule: the QUIZMASTER’s answer is the correct answer even if it is wrong!” The Quiz began in earnest thereafter with Jaysukhbhai, the anchor Quizmaster, firing off questions. He was ably assisted by his sidekicks, Urvashiben and Mayurbhai. After each round the teams swapped answers and marked them, the team with the winning score were awarded prizes which ranged from the mighty shoe horn to the humble tin of loose black tea. There was a mini break at the interval with all having a refreshing cup of tea and homemade cake which was made and donated by Dakshaben. With everyone recharged and energised part deux of the Quiz resumed with the remaining rounds. Time flies when you are having so much fun but no one complained about the length of time as the evening came to a close nearly six hours from start. Everyone boarded their chariots for a safe journey home. Our thanks to all those who attended and supported the area committee and the volunteers for an entertaining event. Check the website for more photos.